Good Morning, I am freezing! Where is summer, I will take it back humidity and all! Wow what a contrast for us here in MN, fall is here. 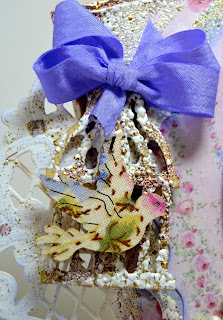 I have a new card to share with you today, this one is all frilly and fussy. The image has been created by Wendy Burns from the All Dressed UP shop. I had a nice surprise when I ordered the group of 4 girls Wear With Style and found out that each individual girl comes in a separate file so you can use just 1 or 2 or whatever you wish. Cool huh?! My image is colored in Copics and liquid pearls are dotted around her. I used Sofiero papers by Maja Design. There are 2 different Frantages on this card also. I frantaged a wooden birdcage and put a bird on it from WOC. You can see a tiny bit of Frantage on my Marianne Die cut too. Magnolia doohickey dragonfly die and more flowers, never enough flowers for us ladies! Here is the single image from the file of 4 Wear With Style. I really like these girls as they are shabby to hip and you can make them bigger to put them on a canvas. I hope you all have a very awesome week! Hello Kelly! we are freezing in Montreal also! Wonderful card, friend! I love your little spiral flowers! too cute. Hugs. So pretty with all those flowers surrounding her. I love that Frantaged birdcage too. It's feeling very fallish in Saskatchewan as well. It seems like all of a sudden, one day a switch was pulled and I am so not looking forward to winter. Fall is here to in PA. Now I know where all the flowers are at!!! This card is fabulous!!! Lots to admire with scrumptious colors. That image is too cute! As always another fantastic creation! Hi Kelly, So many beautiful flowers surrounding this cutie. Love the layout and shape. Our weather has changed to wet and windy too!! Hiya Kelly, Wow!!! what a fabulous creation this is, Love the image, floral arrangements and of course all your pretty dies. Thank you so much for joining us over at Marianne Design Divas this month. Good luck in the draw. Kelly, this is gorgeous. I love the image - I have just been looking at these digis and just may have to add these to my collection. 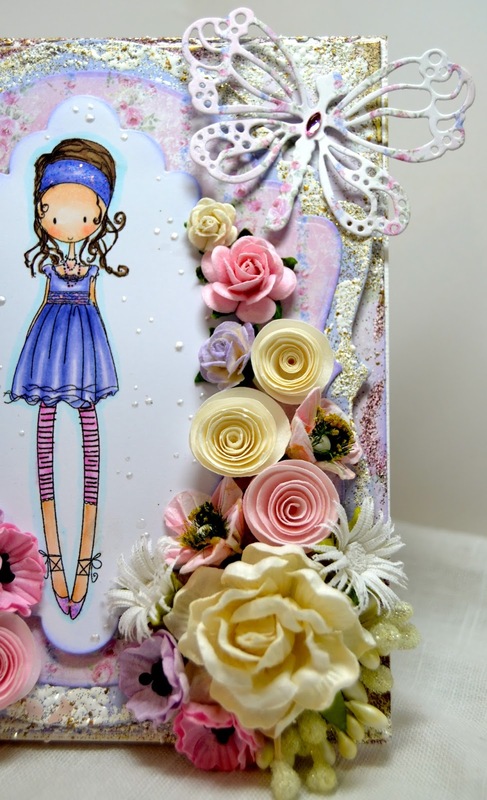 So many beautiful flowers adorning your card. Stunning. PS - the weather in England is generally predictable - lots of rain and quite cold too.....sigh. Ir might be Autumn in North Carolina but it looks like Spring in Minnesota! I do love that little bird - i still hve tried my Frantage!! My heart goes out to the people around Boulder, Colorado and another tragedy in Washington. Today my heart hangs a little heavy. Such a cute image, deliciously coloured, and all those flowers are just gorgeous. The Frantaged birdcage is a delightful touch. Today we've had April weather - alternating lovely sunshine and heavy showers at high speed all day! Ohhhh, Kelly, this is fabulous! Love the darling image and all those luscious surroundings! The birdhouse and bird are so cute and the frantage is gorgeous. Beautiful flower arrangement and cute die cuts! A work of art, my friend! Absolutely stunning! Love the use of Frantage and the wooden bird is so cute. Oh wow this is just soooo pretty and the little flower sprays are so creative. Beautiful colouring.